Welcome to the Jaspon Firm. I am Orlando personal injury attorney, Jeremiah Jaspon and I founded this law firm because I always believe in standing up for what’s right. My entire career, I have stood up to bullies of all shapes and sizes for my clients including the corporate giants and government bullies. I take pride in the fact that my clients call me in their darkest hour after they or their family have been injured or worse, killed in an accident. My goal, as your personal injury attorney, is to always exceed your expectations and help you and your family during your time of need. or at 1-888 We Stand. We stand up for what’s right! The Jaspon Firm has worked with car accident injury cases in the Orlando area for years and we have the experience necessary to help you recover the damages that you are legally owed. Orlando attorney, Jeremiah Jaspon has dedicated the practice to helping victims of automobile accidents recover damages for the exorbitant medical bills and property damage bills that often follow a terrible crash. As an injured party, not only are you facing certain economic losses, there are non-financial losses that affect all victims of car accidents and motor vehicle accidents, as well. Pain, suffering, emotional trauma – these are all losses for which we can help get you monetary compensation. The Jaspon Firm has helped car accident victims in the Orlando area for years and we have the experience necessary to help you recover the damages that you are legally owed. In addition to car accident injuries and wrongful death cases, the experienced legal team at The Jaspon Firm help victims of other personal injury cases such as slip and falls, premises liability lawsuits, medical malpractice, and defective products. The Jaspon Firm is different from other personal injury and auto accident law firms. We will always return your calls and emails, and we will always be available to talk to you and answer your questions. We are an intimate firm and you will be able to have an actual conversation with the attorney who is working with you. When you need help, we will be there to answer your questions. You will always know the status of your case when you work with us. Other personal injury lawyers might shuffle you around from associate to associate – this will never be the case when you work with one of our personal injury lawyers. We are dedicated to providing our clients with respectful and courteous service throughout all of our dealings together. We feel that you deserve nothing less than the best possible legal advice and representation. When a family loses a loved one in a fatal automobile accident, there are often many questions. What happened? Who is responsible? As a personal injury attorney, I hold negligent parties accountable and seek justice on behalf of the victim’s family members. In the case of vehicle accidents, we work closely with law enforcement and investigators to determine the cause of the accident and identify all liable parties. Jeremiah Jaspon is an experienced Orlando wrongful death attorney who is passionate about the legal service he provides his clients. Everyone on our team is sympathetic to your situation and truly cares about your loss. The fact that you are visiting our website is a good first step and we understand that you will have many different questions regarding your possible wrongful death lawsuit. We are here to help and support you. Attorney, Jeremiah Jaspon serves as a local political analyst for News Channel 13 here in Central Florida. If you are injured in Orlando and need to speak with a personal injury attorney, Jeremiah Jaspon will be there for you. Jeremiah Jaspon will take your call or return a call to you as soon as possible. You don’t speak with others in our office about your case you deal directly with Jeremiah Jaspon for legal assistance regarding your injuries and case. We provide free case consultations and can start helping right away. If you were injured and are not sure if you have a case, we encourage you to call to speak with us. It costs you nothing and if you do have a case you’ll be glad you did! Experience matters when choosing a personal injury lawyer! 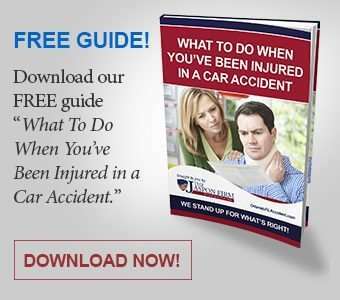 Car accident injuries can be absolutely devastating. When another person has been negligent, their behavior results in you or a loved one being seriously injured. Erratic and hazardous driving or inattentiveness while operating a motor vehicle often results in a severe or life-threatening injuries. Unfortunately, the fact of the matter is that millions of car accidents occur every single year in the United States. The legal team at The Jaspon Firm have worked with car accident injury cases for years. We have the experience necessary to help you recover the damages that you are legally owed. Attorney, Jeremiah Jaspon has dedicated his practice to helping victims of car accidents recover damages for the exorbitant medical bills and property damage bills that often follow a terrible crash. Not only are you facing certain economic losses, there are non-financial losses that affect all victims of car accidents and motor vehicle accidents. Pain, suffering, emotional trauma – these are all losses that we help get you monetary compensation for. With the help of your Orlando auto accident attorney, Jeremiah Jaspon, you can take the legal steps to recover compensation for your non-economic losses as well. When an auto accident occurs, it is very important to contact a personal injury lawyer right away. We provide free, no obligation consultations so it costs you nothing to speak with us. On occasion, we have had clients that delayed contacting us because they thought their injuries were not severe enough. At The Jaspon Firm, we deal with automobile accident injury cases every day. We understand what is involved legally. You need an experienced Orlando personal injury attorney guiding you through the entire process of your claim and recovery. We advise you with dealing with insurance companies, medical providers, and even your employer if need be. If you are injured, it is very important that you seek medical attention right away. Also, it is key that you keep all your medical appointments and that there are no gaps in medical treatments in order to recover the full amount possible for your injuries and losses in a personal injury lawsuit. Be smart and educate yourself on the process. The Jaspon Firm fights tirelessly for our clients. We stand up for what’s right! Would highly recommend to anyone who has ever suffered an auto accident over any of those BIG Law Firms that are not able to demonstrate that level of exemplary customer service… — P.A. Best law firm hands down! They are very patient and really have the best interest for their clients. Would highly recommend. — Vanessa C.
My son was in a bad car accident and the Jaspon team was wonderful with him. I live out of state, but I left him in good hands with Jeremiah Japson and staff. They are very professional and good at what they do!! — Stephanie C.
I can honestly say it was a beyond amazing experience with these people everyone at the Japan firm try’s their best to make sure they’re client is getting the right proper treatment and work so much with you honestly the best firm out there no doubt about it.– Christian A. Great Firm! The staff is not only professional, well informed and prompt, but they are considerate and friendly. Questions are answered quickly and accurately every time. Thank you for being my advocate!– Carol C.
The Jaspon Firm is different from other personal injury and auto accident firms. We will always return your calls and emails, and we will always be available to talk to you and answer your questions. We are an intimate firm and you will be able to have an actual conversation with the attorney who is working with you. When you need help, we will be there to answer your questions. You will always know the status of your case when you work with us. Other personal injury lawyers might shuffle you around from associate to associate – this will never be the case when you work with one of our personal injury lawyers. We are dedicated to providing our clients with respectful and courteous service throughout all of our dealings together. We feel that you deserve nothing less than the best possible legal advice and representation. If you have been injured in an accident, you need to be sure that you can count on your accident attorney to provide you with the necessary legal assistance and representation. We are fully prepared to uphold your high standards of the legal field by giving you unparalleled service and dedication to your case. We understand that it is difficult to suffer a serious injury – that is why we have dedicated our practice to helping individuals just like you. The main advantage of working with one of our skilled Orlando injury lawyers is that every single member of our legal staff is absolutely dedicated to protecting you and standing up for you. We know how stressful and traumatizing it is to be hurt in a car accident. We know that you are possibly going through unimaginable pain and suffering – and that is why we are so committed to you and your cause. Injuries happen and when they do you need to have a lawyer that will have your best interests in mind and recover the maximum amount allowed by law. No one ever expects to be injured, but countless injuries occur every day. If you are injured, you need to find the best personal injury lawyer to help with your situation. In the Orlando, Florida area, there are many law firms to choose from. Why should you choose The Jaspon Firm? Well we are a smaller law firm and we treat all our clients as important individuals. Our caseloads are lower, so we can spend the time it takes to prepare your case properly. When you call our office to speak to a lawyer, you can speak directly with Jeremiah Jaspon about your legal issues and he will answer all your questions clearly, so you fully understand everything. We make the time for our clients and have the track record of success to show it. The main advantage of working with The Jaspon Firm is that every single member of our legal staff is absolutely dedicated to protecting you and standing up for you. We know how stressful and traumatizing it is to be injured. We know that you are possibly going through unimaginable pain and suffering – and that is why we are so committed to you and your case. In Orlando, Florida, car accidents occur every day. People are injured and property is damaged. No one ever really plans for when it happens, but the injuries are real and the damage to property can be expensive. Here are some important facts to know about car accident cases. Legal Representation – Hiring an auto accident attorney is usually advised in auto accident injury cases. Having an experienced legal professional on your side ensures that your rights are protected. Many lawyers in Florida will work with you on fees and many times won’t charge you unless they recover damages for your injuries. Attempting to represent yourself in an auto accident injury case is not advised. You need someone familiar with the laws to protect you. In Florida, it is law that everyone driving must have auto insurance. It is a state law. Florida is a no-fault state. This means that an injured person’s own insurance will provide coverage for medical expenses and lost income no matter who was at fault in the accident. Insurance and lawsuits – If a person was not purposely behaving recklessly such as driving while drunk in most cases an insurance company will be legally required to pay legal expenses only up to the liability limits laid out in that person’s auto insurance policy. Lawsuits – If someone has been deemed negligent, that person or party is responsible for damages that others may have suffered because of the negligence. Reckless driving, if proven by the legal system, may hold a person legally accountable and that person may be required to pay punitive damages. Statute of limitations – People have a limited time in which someone can sue for injuries. Under Florida’s statute of limitations for personal injury cases, parties have four(4) years from the date of the accident to file a lawsuit. Who is legally responsible? In some cases, several people or parties may be held legally responsible for an auto accident. Most of the time, the person being sued is the driver of the vehicle that caused the accident. In other cases, the owner of a commercial vehicle may be responsible. It can be very complicated and guidance from a legal professional is advised. Prove your case – It is important that the victim in an automobile accident prove that the defendant or defendants were reckless in their responsibilities. A skilled Florida automobile accident attorney should have the experience in dealing with proving your case. Seek legal counsel as soon as possible. Do not speak to the insurance companies. Begin consistent treatment with a health care provider to help alleviate your pain. If you have to miss work, make sure to get a doctor’s note. Keep track of all of your mileage to and from your doctors office. Don’t miss any scheduled appointments with your physicians. Keep a diary of how this accident/Injury has affected your activities of daily living. Keep all of your paperwork. If you receive a subpoena to testify against the person who hit you for their traffic ticket, make sure to tell your attorney. Your attorney can go with you to court and may be able to get information during the hearing that could prove to be useful for the case down the line.